PEARL GRAND DOES IT IN GRANDEUR STYLE ! 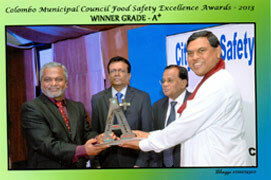 PEARL GRAND HOTEL COLOMBO THE NEWEST AND THE LATEST ADDITION TO PEARL GROUP OF HOTELS EMERGED THE BEST AMONGST THE BEST BY GRABING THE A GRADE + EXCELLENCE FOR THE YEAR 2013 , IN THE FOOD SAFETY HIGH ACHIEVERS CRITERIA. THE EXECUTIVE CHEF MR. DHARMA WICKRAMASINGHE WHO HAS OVER 35 YEARS LONG EXPERIENCE IN THE CULINARY FIELD , MADE THIS HAPPENED BY TREMENDOUSLY CONTRIBUTING ALL HIS WEALTH OF EXPERIENCE AND KNOW-HOW IN THIS ” BABY KITCHEN ” . 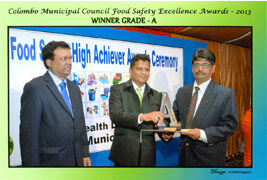 THE KITCHEN IN PEARL GRAND ,IS A “SHOW KITCHEN” FOLLOWING ALL THE NORMS OF THE CRITERIA , LAID DOWN BY THE PUBLIC HEALTH SUCH AS , CLEANLINESS ,ENVIRONMENTAL FRIENDLINESS , HIGH ASPECTS OF FOOD HYGIENE, FOOD PREPARATION , STORAGE , DISPLAY, SELECTION OF RAW MATERIALS ETC; HAD CONTRIBUTED TO THE END RESULTS, OF RECEIVING THIS COVETED AWARD. 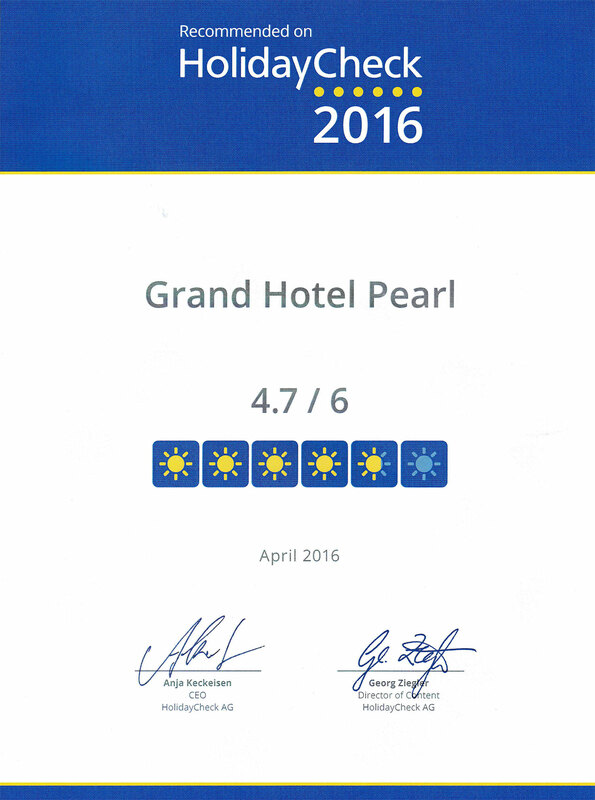 THE OLDER HOTEL OF THE GROUP – PEARL CITY , WAS AWARDED THE ” A GRADE ” AWARD AND IT IS BEEN RECEIVED FOR THE 3RD TIME , IN SUCCESSIVE YEARS.CHEFS MR. ASANKA AND MR. UPALI ,HAD WHOLEHEARTEDLY CONTRIBUTED THEIR MAXIMUM TO REACH THIS AWARD. PEARL CITY RUNS A SAME STANDARD OF KITCHEN , WHICH IS MOST POPULAR WITH MALDIVIAN / INDIAN /PAKISTANI AND NOW WITH EUROPEAN STANDARD CLIENTS , WHO PATRONIZE THEIR KITCHEN.